DE JODE -[Untitled] Tractus Danubii, Tabula II. DE JODE, G. - [Untitled] Tractus Danubii, Tabula II. [Untitled] Tractus Danubii, Tabula II. 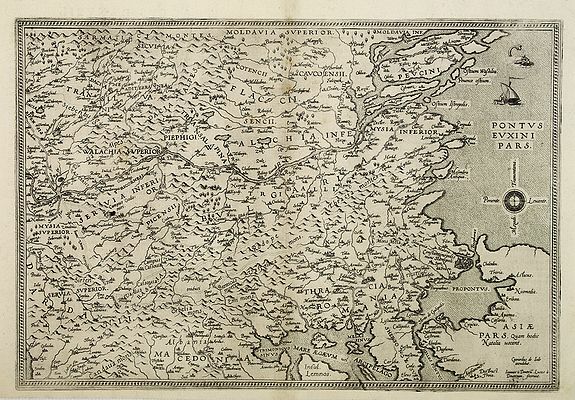 - DE JODE, G.
Title : [Untitled] Tractus Danubii, Tabula II..
Map maker : DE JODE, G.. Size : 13.3 x 19.5 inches. / 33.7 x 49.5 cm. Description :A rare map centered on the eastern part of the Balkan Peninsula. Showing Bulgaria, part of Romania and of Turkey. Engraved by the Doetecum brothers. Gerard De Jode was the great rival of Ortelius, both made a living out of selling maps, and it seems not always on good terms. It is probable that Ortelius was responsible for a delay in the publication of Gerard de Jode's Speculum. Gerard De Jode, 18 years older than Ortelius, owned many more copper-plates for maps than Ortelius had. Ortelius did not employ highly paid engravers as De Jode had done. De Jode received the ecclesiastical imprimatur in 1573, but it was not until 1579 that the first copies of the Speculum were sold at Plantin's shop, and only very few copies were sold. Now-a-days only a few atlases from the first and only edition are known to exist. After the death of Gerard in 1591, the business was carried on by his widow and his son Cornelis, who re-issued the Speculum in 1593, most plates were newly engraved. Condition : Very good and dark impression. Tiny black ink spot, central left hand side. A couple of minor light brown spots central upper part.